After watching the US market decline over fears of US/China trade talks erupting yet again, many were concerned that Asian markets would suffer a similar fate. However, that was not to be the case as most core markets actually performed reasonably well. We did see a small wobble initially for the Hang Seng and Shanghai but was only brief and impressive that they closed at their days highs. The Nikkei managed to strengthen as the day wore-on but, probably aided by the continued decline in the Yen. Exporters were the leaders for many of the sectors as we watched the currency comfortably trade with a 111 handle late Asia/early European time zone. In late US trading we watch as the uncertain DOW meanders around unchanged while the Yen backs to 110.65 range. Political uncertainties continue to have a impact on the SENSEX and the INR. Today we saw the index close on its lows whilst the currency weakens even more to a 68 handle late this evening. Yes, the USD is strong, even against core such as Euro, GBP and Yen but the political shenanigan’s occurring domestically are certainly not helping build confidence for the currency. Europe has seen a weaker session across the region, with Italy again dominating much of the talk. The FTSE MIB lost another 1.5% today with key banks (Banca Monte dei Paschi di Siena SpA, UBI Banca and Banco BPM) down over 5% at one stage and dragging the FTSE Italian ALL-Share Banks Index down by 7% since Wednesday. BTP’s (Italian government bonds) gained another 10bp today to close the 10yr yield at 2.22%. Italian 10yrs have gained 30bp this week alone, but worth considering that they are still 88bp more expensive than 10yr US Treasuries! It has been a very good week for the USD, making ground against most currencies. Lots of talk as US Treasuries continue to fall with 10’s now happily over 3%. 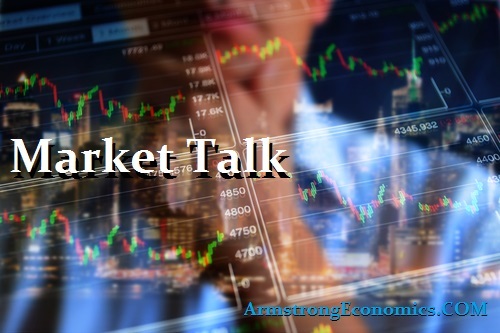 Talk is investors are concerned about the fiscal sustainability, a super-charged economy with cash repatriation as the FED normalisation continues. Or, could this just be the way a market really reacts when the Central Bank raises rates and values are not being manipulated! You have to wonder where some of the European peripheral debt levels would be if it were left to the market to decide. It shouldn’t be a surprise this is friction is starting to play out in the currency market. A quiet session this Friday for US markets with both the S+P and NASDAQ trading lower while the DOW spent much of the day in positive territory. Interesting that the Russell 2k stayed firmer all day as retail continues to nibble at prices. Treasuries have found support as we close the week with yields lower across the curve. Closing levels makes interesting reading for next week. Japan 0.06%, US 2’s closed 2.54% (-3bp), 10’s 3.07% (-4bp), 30’s 3.21% (-4bp), Bunds 0.57% (-6bp), France 0.82% (-4bp), Italy 2.22% (+10bp), Greece 4.45% (+7bp), Turkey 14.48% (+9bp), Portugal 1.84% (+7bp), Spain 1.42% (+2bp), and Gilts 1.50% (-6bp).